The manuscripts are accompanied by a variety of ritual objects, original ketubbot (marriage contracts), and by photographic slides providing a visual travelogue of Seymour Fromers expedition. The exhibition is augmented by a set of poignant photographs taken in Cairo in 1985 by the celebrated Bay Area photographer, Ira Nowinski, along with new work by Nicki Green, a contemporary artist and a graduate student in the UC Berkeley Department of Art Practice. 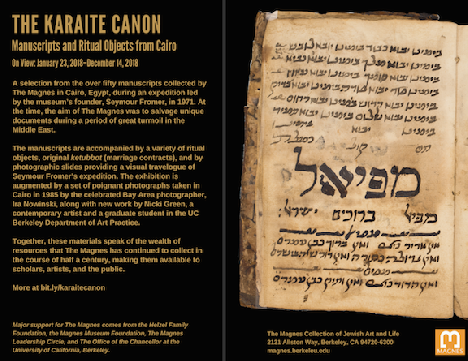 Together, these materials speak of the wealth of resources that The Magnes has continued to collect in the course of half a century, making them available to scholars, artists, and the public.